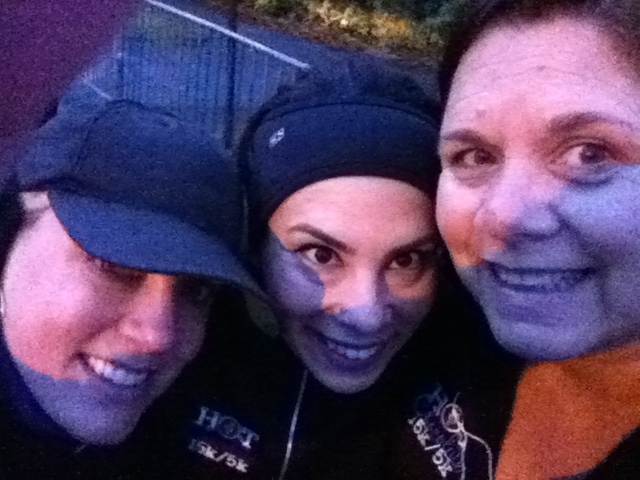 Newjojie, Bella, & Tinkerbell – A smiley selfie before the race! 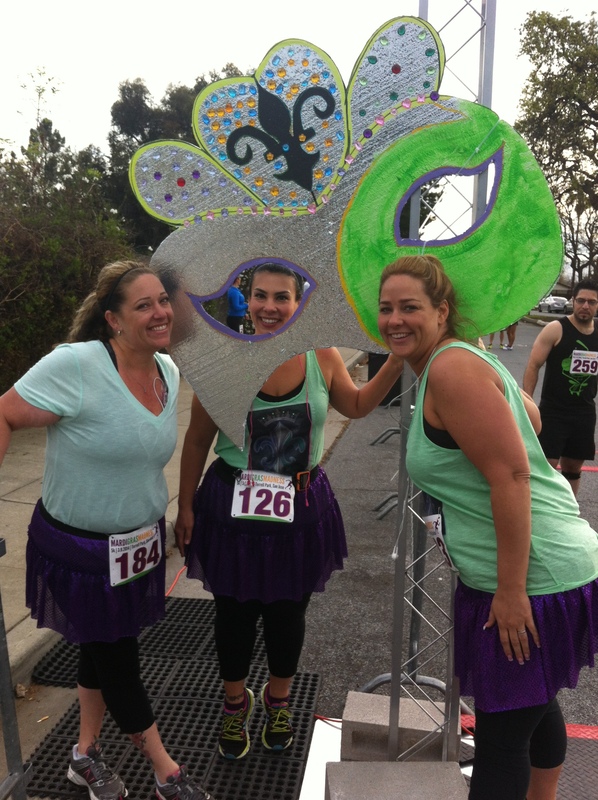 This morning, despite losing an hour of sleep to Daylight Savings Time, Tinkerbell, NewJojie, and I all met at 7:30am to head to the Mardi Gras Madness 5K, which benefited the Leukemia & Lymphoma society. NewJojie is a wonderful lady I met on MyFitnessPal who has been supporting me (and Tinkerbell) for over a year. After Tink and I did the Jenny’s Light 5K, NewJojie emailed me and said to let her know when our next 5K was, because she’d drive the two hours from her house to meet us and join in on the fun. 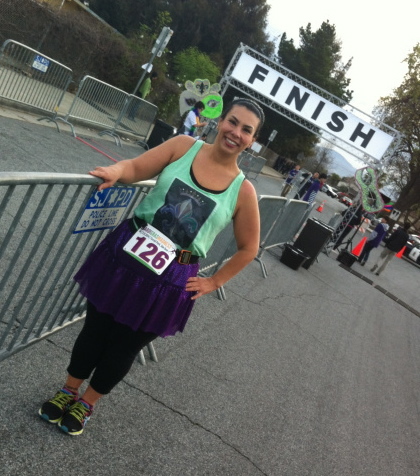 Can you believe that she was willing to drive 4 hours total (2 hours here, 2 hours back) just to meet us and do a 5K?! How special! It doesn’t take much for Tink and I to plan a cute race outfit, but knowing that NewJojie was putting in that much effort, we had to make these extra special. 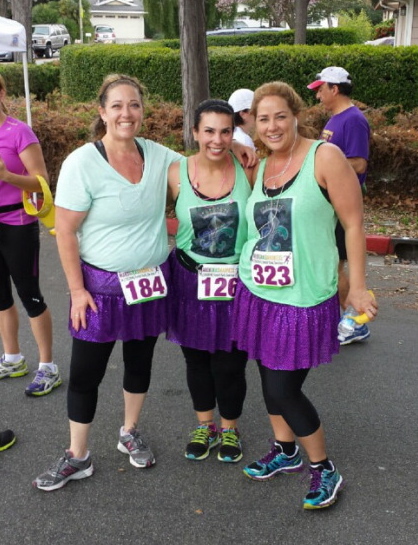 Tink found these awesome, purple, sparkly running skirts from Rock City Skirts, as well as a cool iron-on Fleur-de-lis that said “Laissez les bons temps rouler!” (Let the good times roll!) on it, and because Mardi Gras colors are purple and green, she found cool green Calvin Klein Jeans tanks at Marshall’s (mine’s a L!!). We were all set to turn heads for this race! 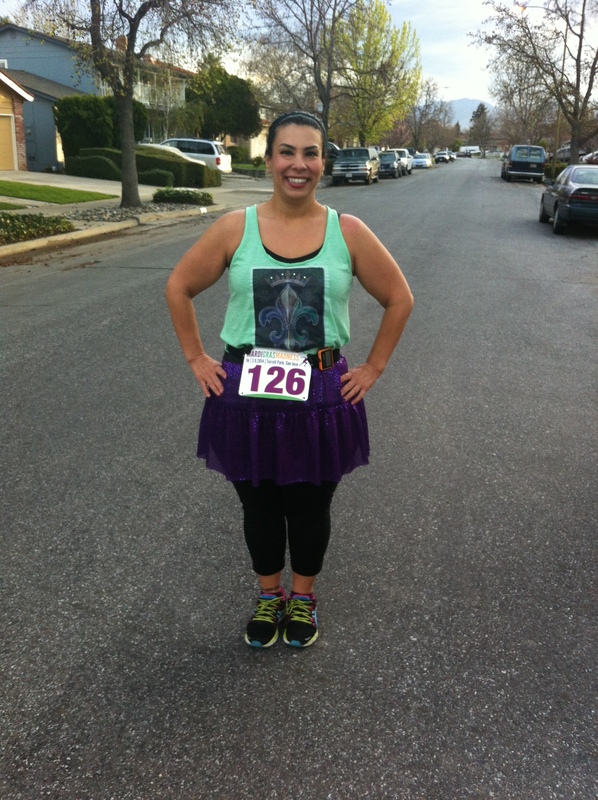 You can’t tell from this pic, but the skirt is sparkly, adding just the right amount of Mardi Gras bling to the morning. Everyone who saw us told us how much they loved our skirts, our matching outfits, our entire look. It was fun to hear before the race, and even better as we were running the 5K. I woke up way before my alarm, probably because I was so worried that I’d have a hard time getting up and losing the hour. So I had a leisurely morning starting at 4:30am – time to shower, get dressed, begin writing my weigh-in blog post, and have half a cup of coffee before I left. 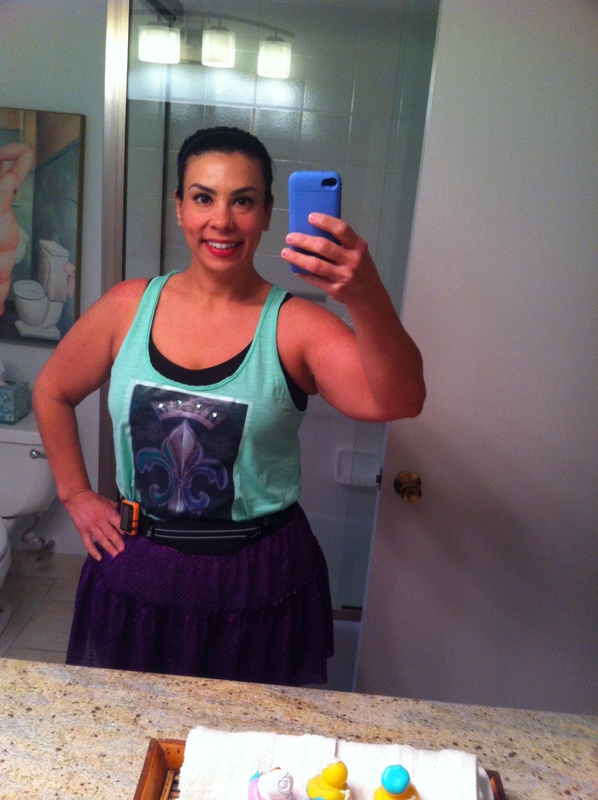 It wouldn’t be a race day if I didn’t take my ritual bathroom selfie before leaving the house for the race. Since they were handing out bibs and shirts on race day, we wanted to make sure to get down to the race with plenty of time to spare. What would we do with the extra time? Take pre-finish photos, of course! Our thinking was that we wanted make sure we got a good shot with the Finish line in the background. I love the cool angle Newjojie used for this pic! Then it was time to put down the phone cameras and get ready to race. Newjojie and Tinkerbell are both more experienced runners than I am, but they were sweet and agreed to run at my pace, which was 2min run/1min walk. On the treadmill my pace for the run is 4.5mph and the walk is 3.5mph and it’s a great pace. I feel strong and comfortable. Outside, it’s a whole other story. I always start out too quickly when I’m running outside, and today was no different. In fact, I’d shot ahead so fast that Tinkerbell told Newjojie, “just let her go” with a smile. I’d warned them both that the momentum and adrenaline gets to me at the beginning of a race and I go much faster than I can sustain for an entire race. And within a minute or so, I realized I needed to slow down and go at a more moderate pace. Tinkerbell matched my pace, and Newjojie was leading our way, a few paces ahead of us. We were running for what seemed like forever, and I was wondering why my interval timer hadn’t beeped to indicate we should start walking when I looked down and discovered it wasn’t on. Doh!! I apologized, turned it on, and we started the true run/walk. 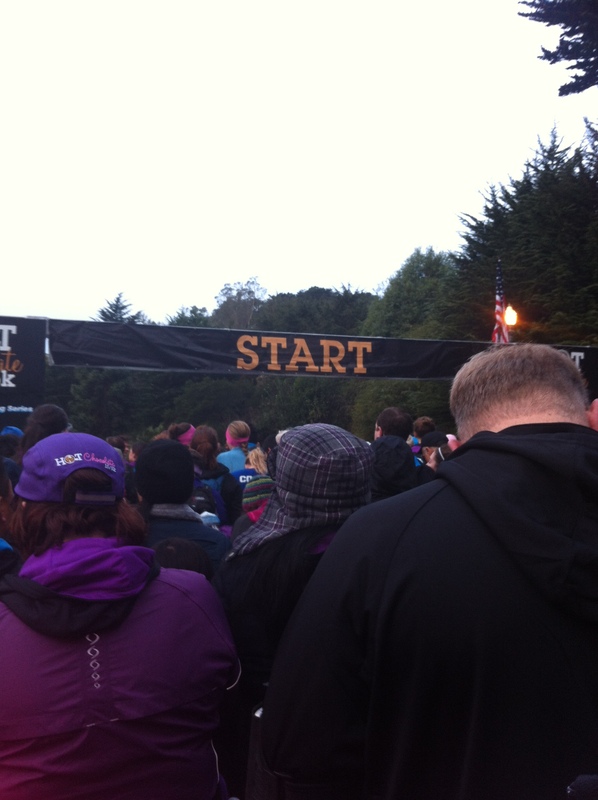 The beginning of the race, until about mile 1.3 was good. I was running well, and felt strong. And then right before the turnaround, my breath became more labored and I was having a much harder time with the runs. Being outside is just so much more difficult, and I probably should’ve paced myself even slower so that I didn’t get that slight burning feeling in my lungs when I ran. But all it took was Tink holding my hand and encouraging me during one of the walking portions for me to know I was going to keep this up, even if I had to slow down a bit to do it. Twice, I stopped my run portion about 30 seconds early, apologizing profusely to Tinkerbell and Newjojie, as I told them to run ahead without me and I’d catch up. Tink told me I had nothing to apologize for, and she and Newjojie actually did a loop around to meet me at my pace when I was back to my run. 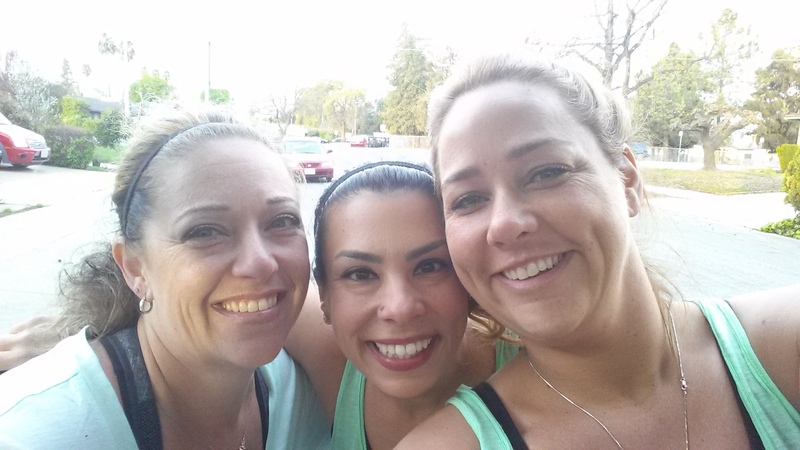 What awesome running pals these two are! Newjojie snapped this action shot of us. Once we hit 2.85 miles, I felt a renewed energy. We agreed we’d continue the run/walk pace until we could see the finish line in sight, and then we’d run into the finish line, as Carina taught me. 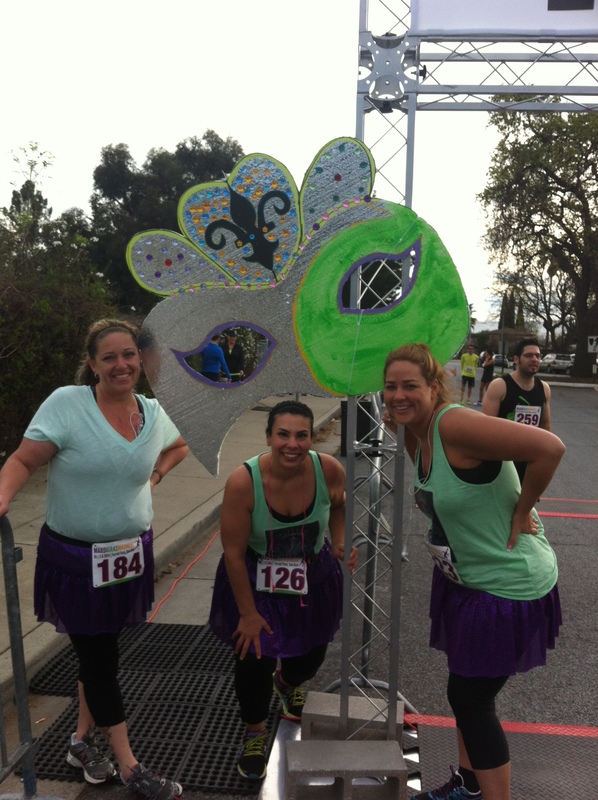 It must be a surge of adrenaline that comes with that FINISH sign, because I felt amazing as we ran into it!! 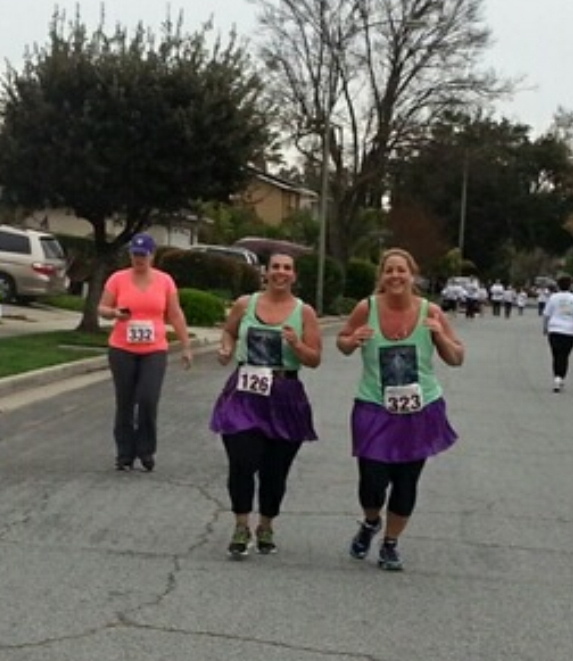 The race organizers captured this great shot of the three of us running into the finish line (bottom left). They loved our outfits so much that they used the pic on their FB wall. How cool is that?! After the race, with water and banana in hands. All told, I hit another PR today!! 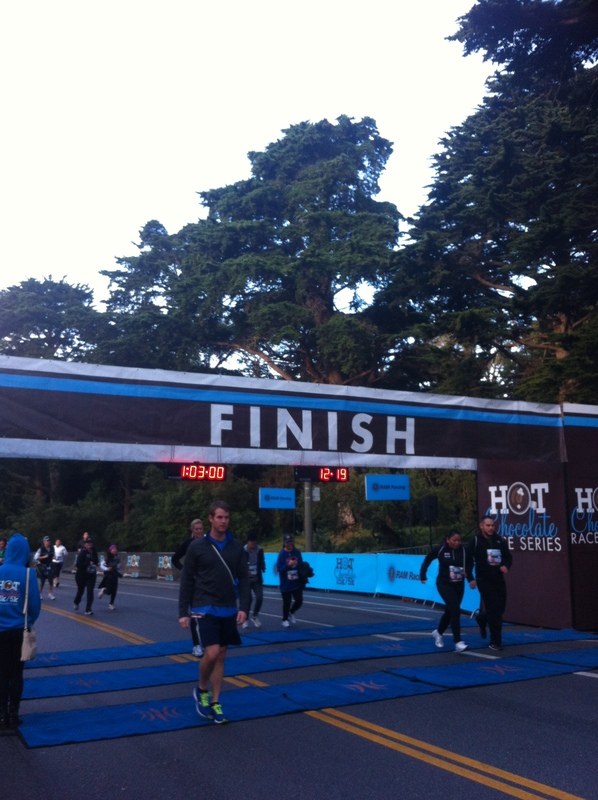 I completed the race in 42:21.44, which is a pace of 13:39/mile! 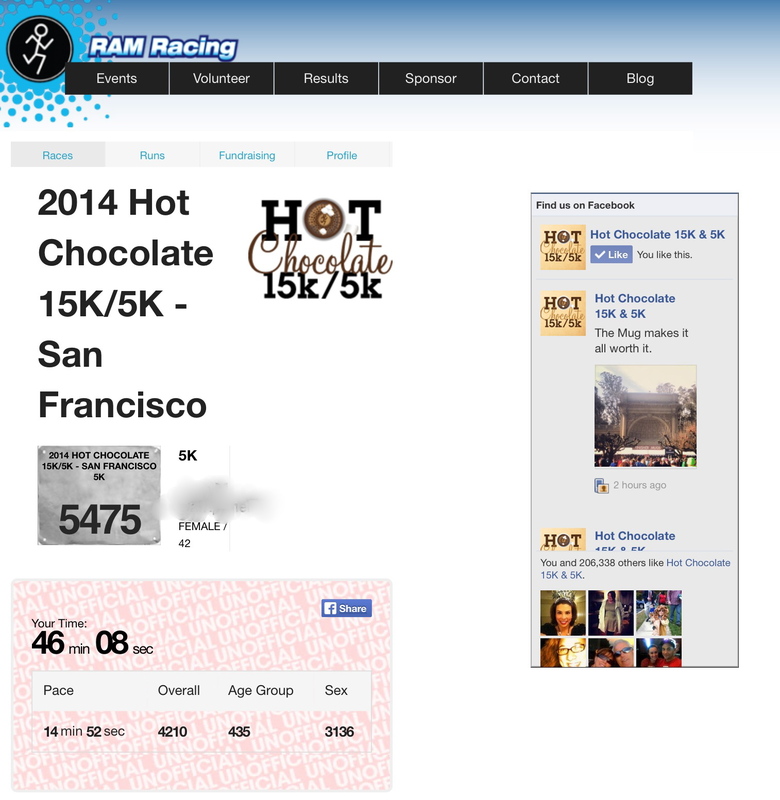 That’s 3.87 minutes quicker than my pace at the Hot Chocolate 5K in SF!!!!! I’m so proud of myself! It goes to show that I’m much too hard on myself when I’m running. I was getting so down on myself and frustrated that breathing was getting challenging and that I had to add 30 seconds to my walk a couple of times. 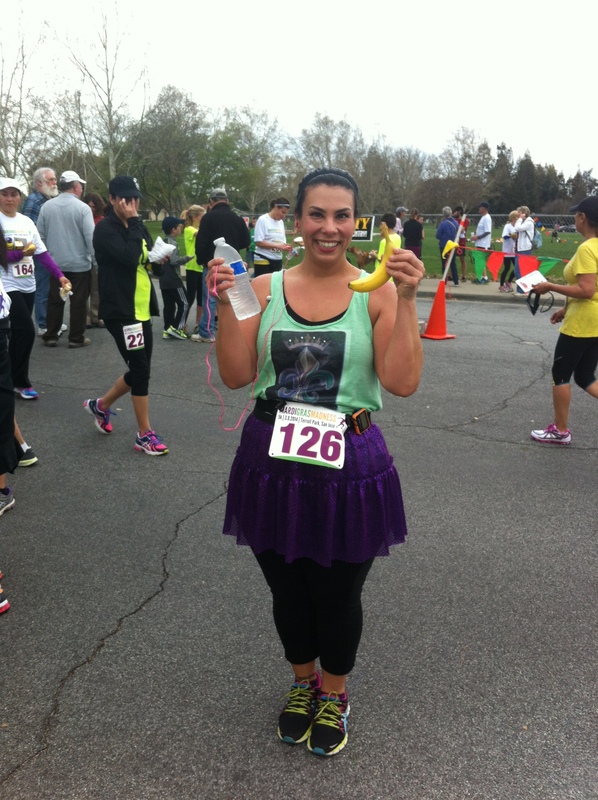 In reality, I had my best time yet, so I need to cut myself a break on the next 5K and really just enjoy the day. I would’ve never been able to do any of this 126 pounds ago, so I need to relish that fact! Beyond my personal accomplishment, the best part of the day was doing the 5K with these amazing ladies. Tinkerbell is one of my best friends, and now Newjojie has become an “in-real-life” friend, too. We’re already planning our next 5K, when Tink and I will drive up to Newjojie’s neck of the woods. I can’t wait!! 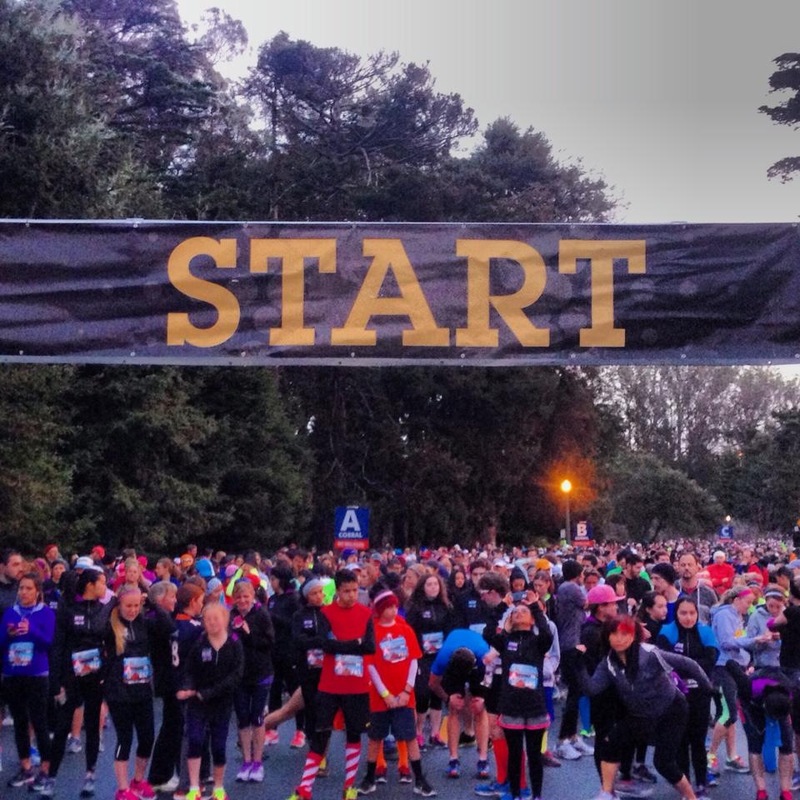 This morning FaveCousin, KE, and I woke up before dawn in order to participate in the SF Hot Chocolate 5K, benefiting Ronald McDonald House. 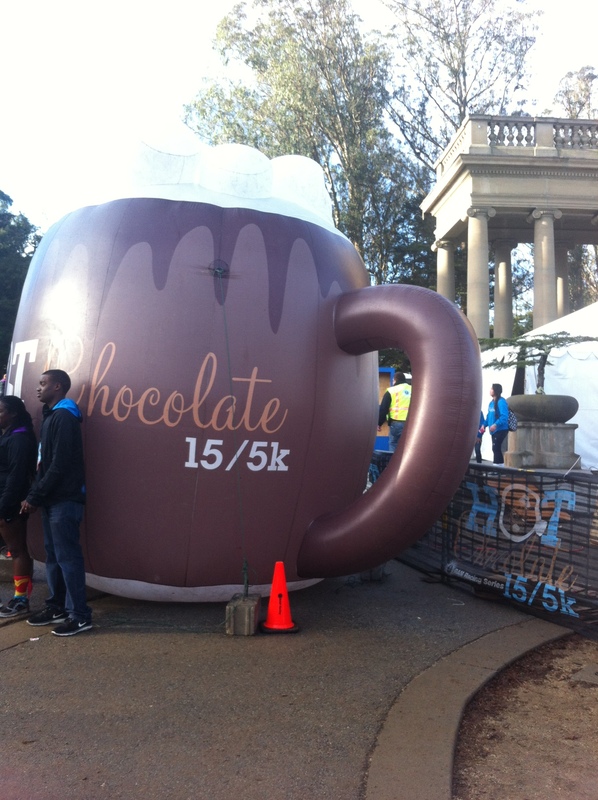 I’d first heard about the Hot Chocolate 5K back when I went to the SJ RocknRoll expo. The name sounded so fun, and I knew it would be a great way to start off the new year. I was so happy that FaveCousin wanted to do it with me and said I could stay overnight with her. She and I had a good time at the Mermaid, and this time KE (FaveCousin’s cousin’s wife (in Italian families things can get complicated)) was going to do it with us, adding to the fun. 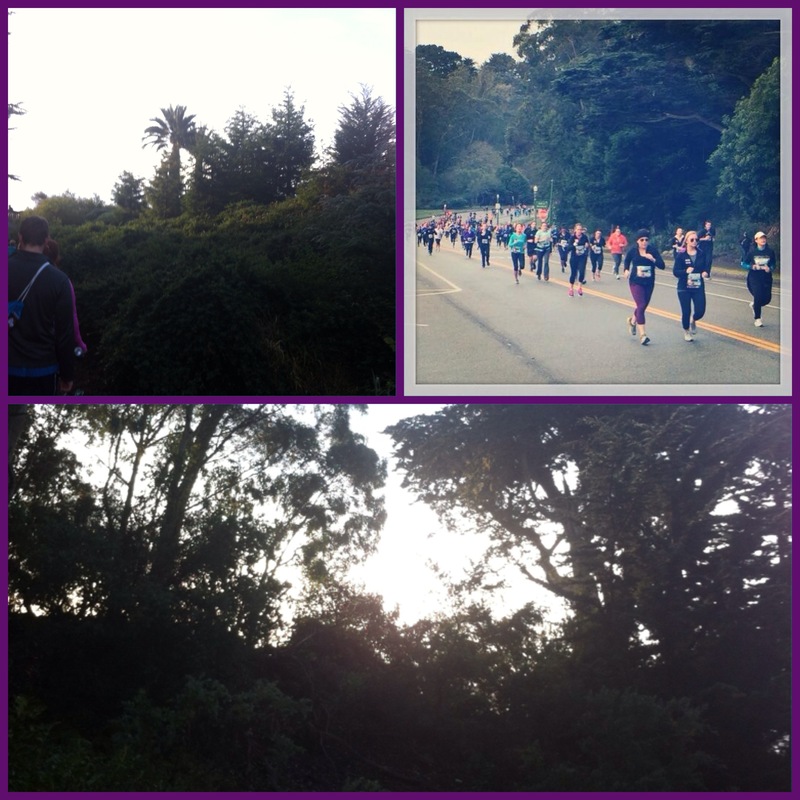 It was freezing this morning in Golden Gate Park, but after yesterday’s drizzly weather, we were glad that it was clear. I am so glad that I had the wherewithal to bring my earmuff headband (is that what you call it? ), because it helped keep me a bit warmer. 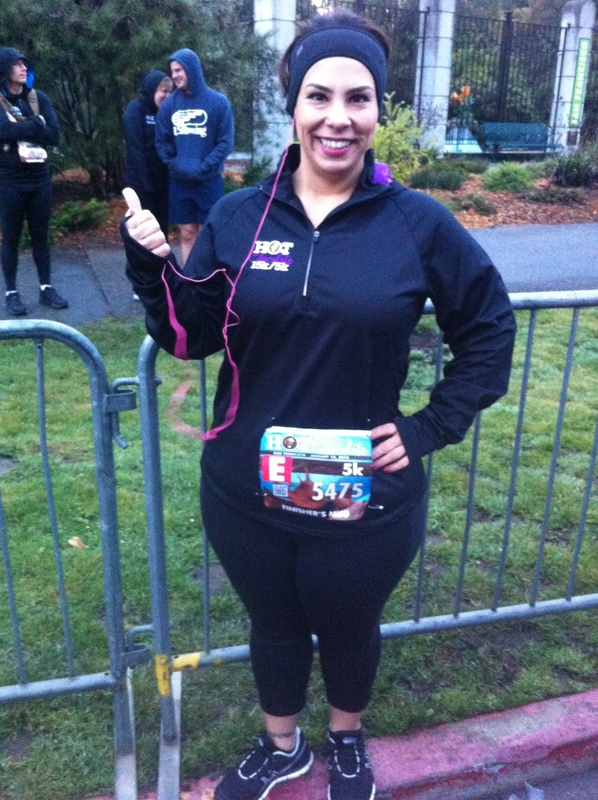 Check out the cool technical hoodie they gave us as a race shirt. I’m so proud that I fit into a Women’s XL. For me, the worst part of any 5K is waiting for the race to start. To get myself in the right frame of mind and get past my nervousness about running more of the 5K than I ever have before, I got my playlist going. Music is phenomenal for calming nerves isn’t it? 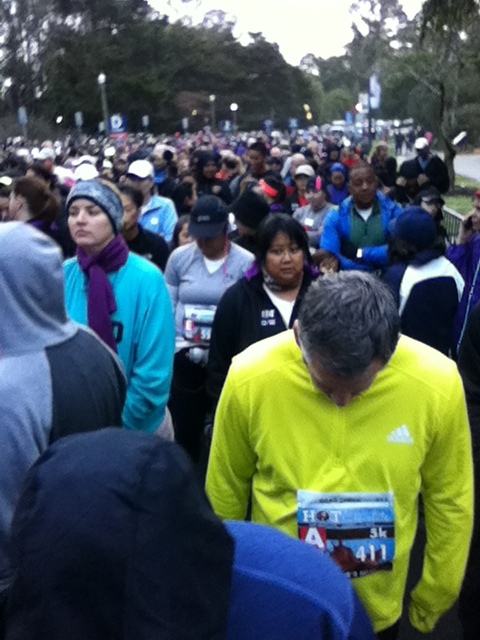 The line of people waiting behind me to get this 5K started! Soon enough, we were at the starting line. 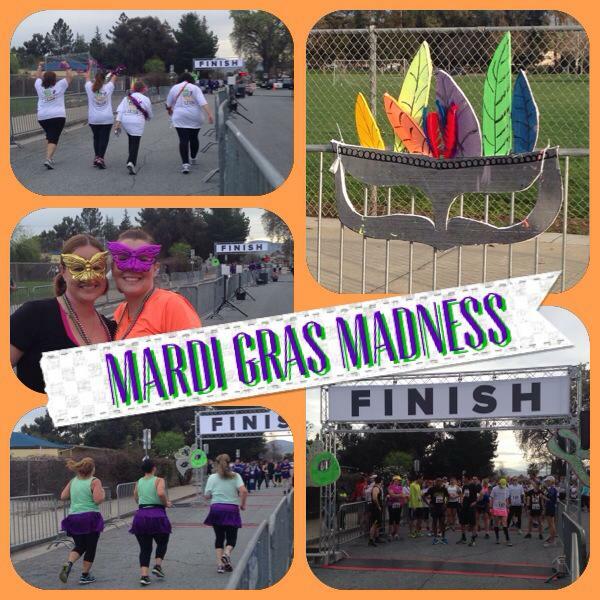 The pic on the left is the one I took, the one on the right is the one from the 5K’s FB page. For a small race that few people had heard of, there sure were a lot of us out there. The thing I didn’t really think about when planning my 5min run/3min walk intervals was the fact that this is SF, and even in Golden Gate Park, which is relatively flat compared to some streets in the city, it still has some steep inclines. 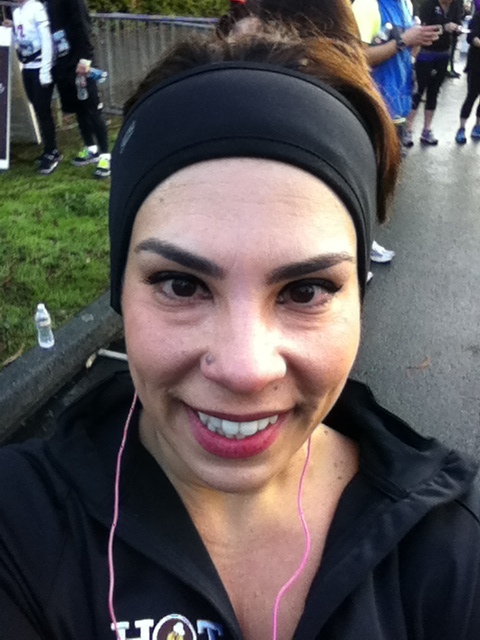 It became pretty clear to me that I was going to have to wing it – I ran as long as I could and walked when I needed to. I made sure that I was running at every down hill slope and I pushed myself to walk as fast and hard as I could during the inclines. In fact, I was walking fast enough that I was passing some of the slower joggers. I know I’m going to feel some of that tomorrow. So while I didn’t keep my intervals perfectly timed or regulated, I am proud of what I did out there today. Look at these beautiful views that I got to enjoy while I was out there today. San Francisco is such a gorgeous city! I mean, c’mon: “It’s not where you are, but where you’re going. It’s not about the things you’ve done, it’s what you’re doing now.” These were the absolute perfect lyrics to keep my feet running even after my body told me I was getting tired. I was completely inspired. (Both songs are on the Wogging My World mix from RockMyRun, if you’re interested). And just was the song was finishing, I saw the mile 3 marker and the Finish line in the distance. I took knew I was going to run myself through that line no matter what. Talk about a moment of pride! In fact, I was so overcome at the end of this race for all that I’d just done, that I got really emotional again. Tears in the eyes and everything. I almost went into the ugly cry, but stopped myself. It just hits me every time I run a new race about how far I’ve come, all that I’ve accomplished, and how grateful I am for this new life I’ve created for myself. I think you can see the tears in my eyes in this shot. Soon after, I met up with FaveCousin and KE, and we all enjoyed our Finisher’s Mug of chocolate fondue, complete with the fixings – a mini rice krispie treat, a petite banana, some mini pretzels, and a marshmallow, along with a steaming mug of hot chocolate. I allowed myself a bit of the fondue with the banana, rice krispy, and marshmallow, but skipped the hot chocolate and the pretzels. So delicious! 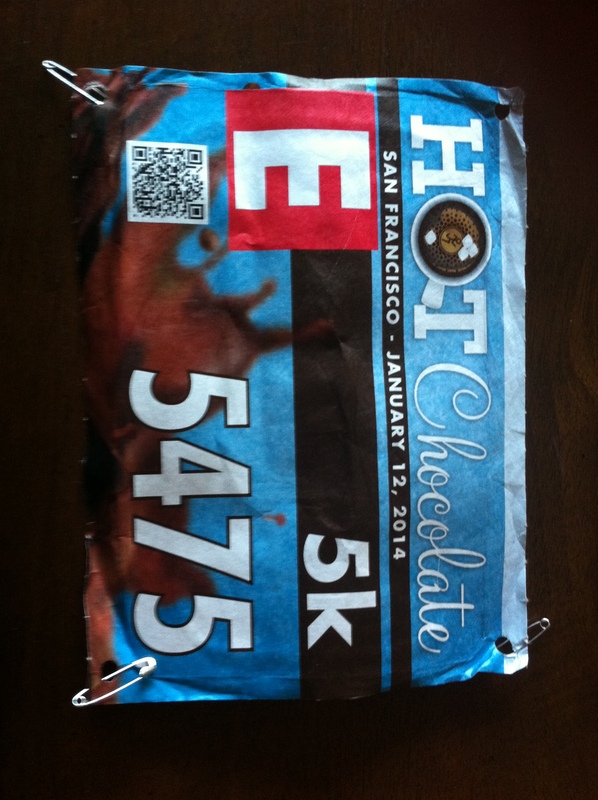 The entire race was so well run and organized that I’ll definitely do it again next year. If it comes to a city near you, I highly recommend that you join in on all the fun. Oh, and the sweetest part? I shaved 2 minutes and 50 seconds off of my Santa Run time, even with all the inclines in this race!!! 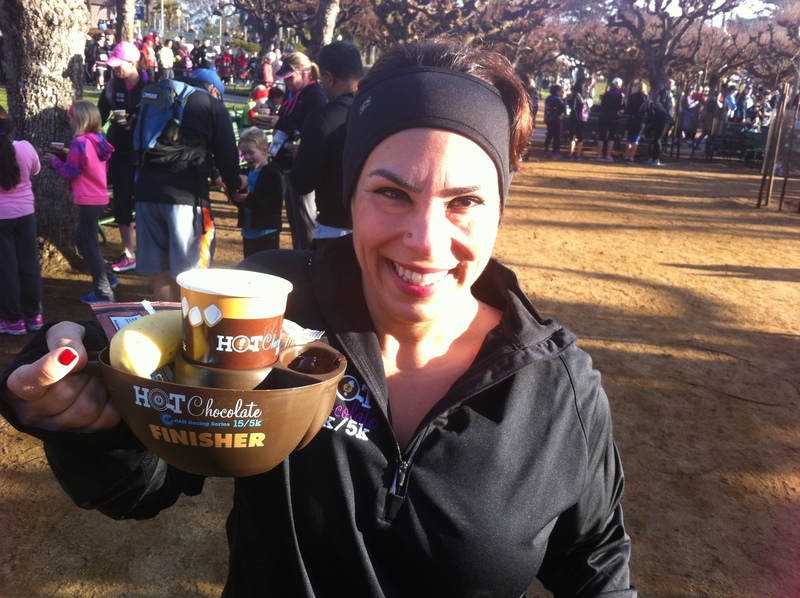 I completed this one in 46 minutes, 8 seconds – a new PR! !